Hello all you great fans! I am very sorry I could not be on the internet air last week but it was unavoidable. Hey, we are going to make it up to you on this eposode! I have a show from the Ohio Prepper Show in Bowling Green Ohio. This show we talk to the founder of the show and longtime Prepper Nick Getzinger. He talks about this amazing show and his Prepper Business. This show was a Prepper show, gun show, Monster Truck race and fireworks display! Listen to this broadcast or download “Prepping up in Ohio” in player below! 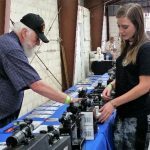 We also talk with a very pretty lady Kattie Watts about Osprey Global maker of great optics at affordable prices. They make all kinds of scopes, sights, range finders and binoculars that are high quality but NOT high priced. Tune in to this show to get a VERY special show deal only for our listeners. Call Kattie at 859-684-3620 for the show special 10% off anything and FREE shipping. I will also have a very special announcement at the end of this show so please tune in. Previous: Previous post: Off Grid Air-Conditioning! Next: Next post: Introduction, Culmination and Cultivation!